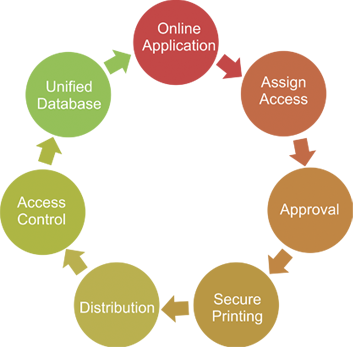 ProtaTECH is pleased to offer a complete end-to-end accreditation management solution. Whether you need an employee ID system, or a large event accreditation solution, with ProtaTECH, state-of-the-art technology is used throughout the entire credentialing process. If you need robust accreditation database solutions and up-to-date, cutting-edge credentialing technology, please contact us today so we can put you in contact with our accreditation experts. ProtaTECH is pleased to offer a complete end-to end accreditation management solution. Event accreditation packages can be tailored to specific event needs regarding pre-event registration, data management, printing, distribution, and access control. ProtaTECH provides the personnel and equipment to manage the accreditation process, and we can even design the look of your credentials incorporating a variety of available security features. Successful implementations of our full accreditation solution include BCS National Championship Game 2014, Rose Bowl 2014, Rose Bowl 2013, Rose Bowl 2012, Rose Bowl 2011, Rose Parade 2012, Rose Parade 2011, Law Enforcement Torch Run 2010, and SportAccord 2010. In partnership with our WISH product system, we can also print Employee ID cards with various security features and scanning technology. This facilitates Sign-in/Sign-out, WISH employee features, and even access control. 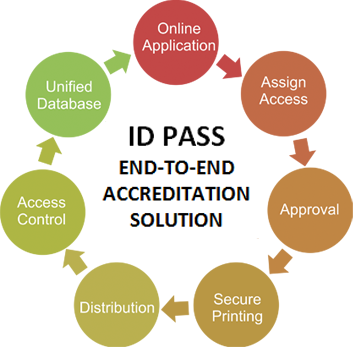 ID PASS is the backbone of ProtaTECH’s accreditation registration and access management system. ID PASS is a web-based, multi-lingual, secure application that is customizable to individual client requirements. Our experienced professional design team works closely with our accreditation clients to customize the website and credentialing process workflow that meets your specific event management needs. Our system employs multiple checks and balances to ensure that every credentialing request is properly evaluated, access is assigned, and each badge is correctly printed and distributed. Even before ProtaTECH began to offer a full turnkey Accreditation service to our clients, our ID PASS technology was the power behind the accreditation services at world-class events such as PGA Tours, The President’s Cup, and NFL Super Bowls where the 2005 event involved processing more than 75,000 online registrations. Hard Plastic Credential - Hard to Duplicate! Technology is embedded, not just attached so it cannot be removed, reused, or duplicated. The individual's photo cannot be altered or replaced. Embedded features cannot be copied or scanned. Credentials cannot come or tear apart. The printers for plastic cards are expensive and not easily accessible. Laminates - Easy to Duplicate! Easy to remove and reuse any security feature (e.g., data chip, hologram, etc.). Easy to peel apart, often come apart on their own. An image can be pasted over the existing one and the credential can then be re-laminated. Laminated badges are easy to duplicate with a good quality copier or scanner. Copyright © 2015 ProtaTECH, Inc. All rights reserved.